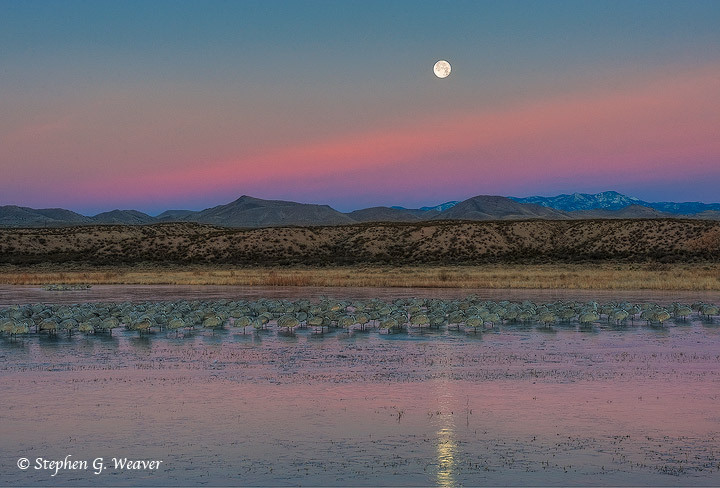 I took my my annual trip down to Bosque del Apache NWR this year during the last week of December to coincide with the full “Blue Moon” on December 31/Jan 1. I often time my trips to coincide with full moons so that I may photograph moon rises and moon sets. The best time to photograph a moon rise is usually the day before the full moon, as the rising moon will occur before sunset and allow a nice balance with sunset light. Of course if there are clouds on the eastern horizon, the moon is obscured and that was the case at Bosque this year. The best time to photograph the full moon set is the morning following the full moon or occasionally one morning later. Again the idea is to balance the position of the moon with the pre-sunrise light. Another interesting element that may be present is the earth shadow. In the western US, if the horizons are clear before sunrise or after sunset, the presence of the earth’s shadow is often visible as a pink and blue band on the horizon opposite the rising or setting sun. The juxtaposition of such an earth shadow with the full moon can make a stunning image, and this was one of the images I was after at Bosque. I was fortunate to have almost perfect conditions on the morning of New Years Day and managed to make the image seen here. A few clouds were present that masked the effect of the earth shadow but they took on the wonderful pink glow of pre-sunrise light that photographers love. 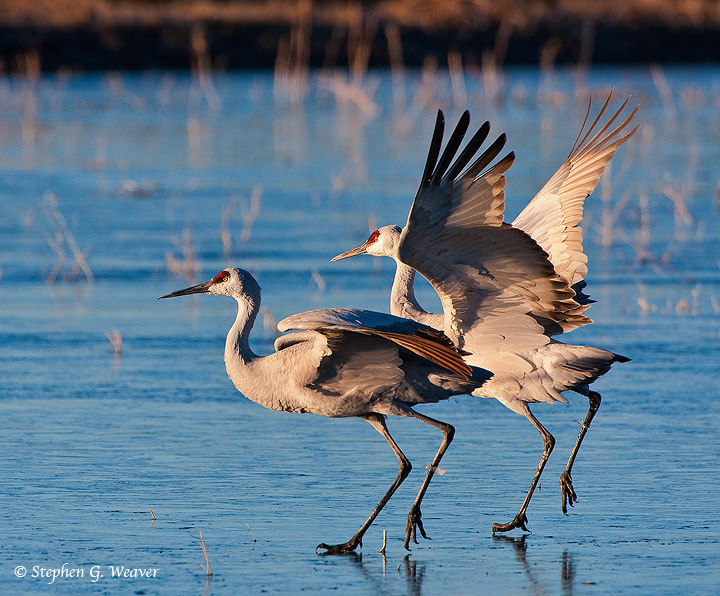 It was cold enough that a group of Sand Hill Cranes were huddled together with their necks buried in under their wings and their legs actually frozen in the ice. After the sun rose it was quite comical watching them trying to extract themselves and then run and slide across the ice to take off. Capturing a moment: Sometimes you get lucky! For many years my photography has primarily concentrated on capturing the composition, light and form of the grand and intimate landscape. However for the last couple years, I have started to take up the challenge of bird and wildlife photography because I feel that as a photographer I needed to grow and challenge myself in new ways. Making artful images of wildlife is not easy and I have gained a great respect for those photographers who specialize in wildlife. One location I have traveled to for the last few years every December or January is Bosque del Apache National Wildlife Refuge in New Mexico. Here there is an amazing concentration of Sandhill Cranes and Snow Geese and it provides great opportunities to practice the art of birds in flight photography. Believe me it is addicting, and at least with modern auto-focus technology and high shutter speeds, the photographer has some chance to capture a sharp image. The real challenge is to make artful compositions of subjects that are in constant motion. The bottom line is that many many Birds in Flight images wind up in the trash, but occasionally you get lucky and capture a moment in time of grace and beauty. 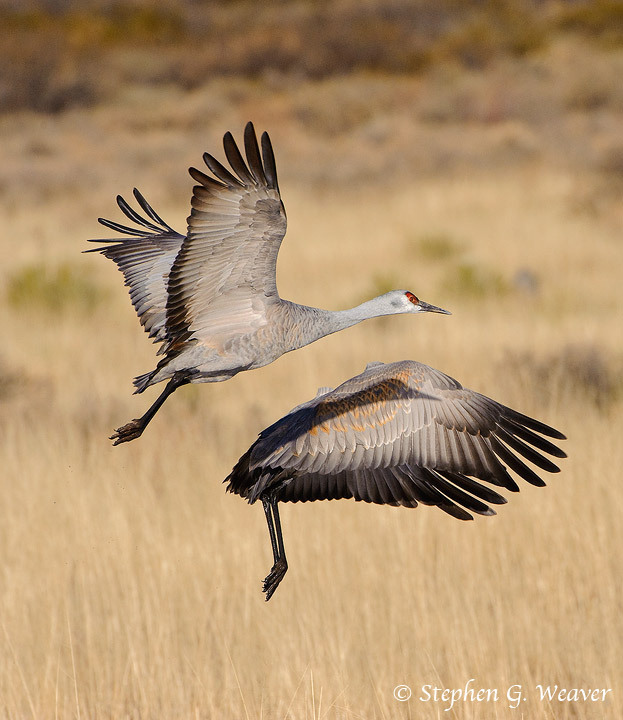 The image of a pair of Sandhill Cranes in flight I post above is an example of all things working together: light, form, and a perfect juxtapostion of elements captured at precisely the right moment in time. Sometimes you get lucky! I am very honored that this image has been awarded an Editors Choice Honorable Mention in this years Audubon Magazine Birds in Focus Photography Contest.